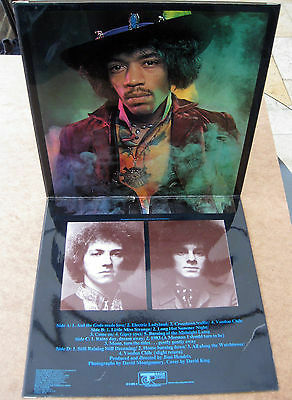 Jimi Hendrix ELECTRIC LADYLAND UK LP Track BLUE TEXT!! PLAYS 100% MINT MINUS!!!! I AM HAVING A SMALL LISTING BREAK BETWEEN CHRISTMAS AND THE NEW YEAR BUT LEAVING THIS INCREDIBLE COLLECTIBLE UP FOR GRABS OVER THE FESTIVE PERIOD. THE MATT BLACK LABELS ARE IN MAGNIFICENT CONDITION. THE BLACK BASE COLOUR FULLY STRETCHES INTO THE UNWORN SPINDLE HOLES. BOTH VINYLS ARE IN SUPERB CONDITION. THEY GLEAM LIKE THEY WERE JUST PRESSED AND THERE IS NO FOGGING OR ANY MARKS ON EITHER OF THE ALBUMS.THEY LOOK FLAWLESS IN DAYLIGHT. I HAVE RECORDEDTHE ENTIRE LP SET FROM START TO FINISH AS I DO WITH ALL MY LISTINGS, AS I FIRMLY BELIEVE THAT BIDDERS WOULD LOVE THE OPPORTUNITY TO BE ABLE TO HEAR THE RECORDS BEFORE LAYING A BID. I HOPE YOU AGREE THAT THE REPRODUCTION FROM THIS SET IS JUST BRILLIANT. BOTH DISCS PLAY MAGNIFICENTLY ALL THE WAY THROUGH. TRYING TO FIND A GREAT COPY OF THIS ALBUM IS VERY HARD AS IT WAS A VERY POPULAR LP IN IT'S DAY AND MOST COPIES ARE TRASHED WITH SLEEVES TO MATCH. HERE WE HAVE WHAT I CAN ONLY DESCRIBE AS A NEAR FAULTLESS PERFORMANCE. THE FIRST THING TO NOTE IS THAT THE SOUND IS DISTORTION FREE APART FROM THE GUITAR WORK THAT SHOULD SOUND DISTORTED OF COURSE. THIS SHOWS THAT THE LP'S WERE PLAYED ON A SYSTEM THAT HAD A CORRECTLY TRACKED STYLUS, AND ONE THAT WASN'T DAMAGED EITHER. I HAVE NO HESITATION IN GRADING THiS BEAUTIFUL VINYL SET MINT MINUS!!! THE FRONT SURFACE IS FLAT AND CLEAN AND JUST GLEAMS LIKE A MIRROR. THERE ARE NO HEAVY CREASES, NO CREASE LINES, NO BENDS, AND ABSOLUTELY NO RING WEAR OR EVEN MILD RECORD SHAPE. .
THEREIS JUST ONETINY LAMINATE LINE CLOSE TO THE BOTTOM OF THE SPINE.TWO MICROSCOPIC ONES ON THE VERY TOP EDGE, AND ONE EQUALLY TINY ON THE BOTTOM EDGE. NO THUMB LINES WHATSOEVER!!! THE TWO OPENING EDGES ARE AS SHARP AS THEY POSSIBLE COULD BE,.THE SLEEVE HAS BEENCLEARLY HANDLED WITH EXTREME CARE WHEN REMOVING THE RECORDSFROM THE SLEEVE. THE REAR SURFACE IS VIRTUALLY AS MAGNIFICENT AS THE FRONT WITH TWO REALLY SMALL LAMINATE LINES CLOSE TO THE SPINE. ONE ON THE TOP EDGE, TWO ON THE BOTTOM EDGE AND ONE VERY MILD THUMB LINE CLOSE TO THE OPENING EDGE. THERE IS ALSO A LIGHT SCRATCH LINE DOWN THE MIDDLE. OPENING THE GATEFOLD REVEALS A FULLY LAMINATED AND GLOSSY PAIR OF PANELS WHICH ARE AS IMMACULATE AS THE REST OF THIS SLEEVE.WITH JUST ONE LAMINATE LINE ON THE RIGHT EDGE NEAR THE BOTTOM. A TRULY EXCEPTIONAL EXAMPLE OF THIS CLASSIC SLEEVE AND I BELIEVE FULLY JUSTIFIES A MINT MINUS GRADE!!! !